It was my privilege and honor to be a member of the Reagan Junior High School 7th grade football team in Sweetwater, Nolan County, Texas in 1951. 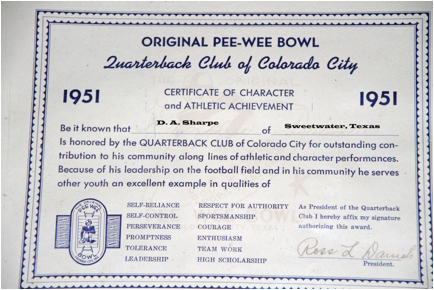 Four west Texas teams competed in the Pee Wee Bowl of West Texas in Colorado City. The certificate below was like what players from all four teams received. However OUR TEAM did win the playoffs and the Championship! I was 12 years old!